We admit it. Pizza is a fad. And we drank the Kool-Aid on it and learned our lesson, BIG Time! It takes a big man to admit he was wrong but it takes a bigger man to fix it by making grilled cheese sandwiches instead. What? Yep, that's right, we're going to stop selling pizza and start selling grilled cheese sandwiches. Pizza is lame, you can get whole pies for $5 from Little Caesars. All pizza is the same, in other words, pizza is pizza and its only for poor people in the ghetto. 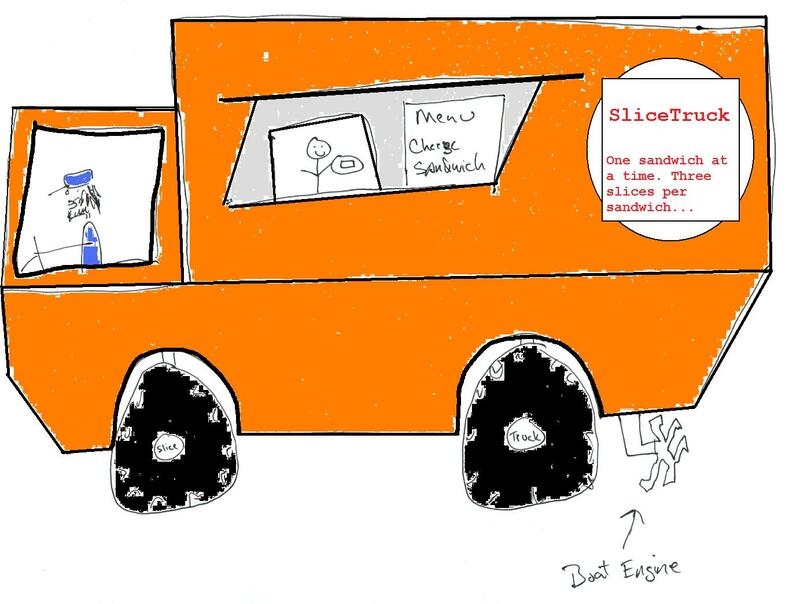 We didn't come to L.A. and buy a catering truck to sell pizza to losers in the ghetto, we came here to be cool food truck guys and make bank. So as of today we'll be selling grilled cheese sandwiches, I mean gourmet grilled cheese sandwiches, I mean fusion gourmet grilled cheese sandwiches, from a boat truck. Yes, believe it. Some things will change and some will stay the same. Here's the list. Name will stay the same. SliceTruck. I know it will now be a boat truck but we're sticking with just truck. Slice is easy, slices of bread slices of cheese, its actually a more fitting name now because before it confused people who wanted a whole pizza. Food will change. Fusion gourmet grilled cheese sandwiches. We butter up a couple slices of artisan bread, throw a slice of cheese between it and dust the butter with Parmesan and throw it on the griddle. $8 come and get it and have fun trying to do this at home. Truck will float and therefore we'll make weekly stops at Catalina and the Channel Islands. Logo will change a little bit. We'll be leaving the lame upper middle class and will be joining the ultra wealthy elite ruling class with all our new money. See ya suckers, stop by for a grilled cheese sandwich on your way to the casino when you get paid next Friday. LOL!!! Get outta the ghetto and cruise down to my hood. Folks here pay crazy money for a grilled cheese.